High-torque, gear-reduction design. 100 percent NEW, not rebuilt. Offset design results in more clearance between the oil pan and the starter, and can be rotated for additional chassis clearance. The high-torque, high-output motor spins the engine over faster than stock starters, delivering 40-50 percent more cranking power. 3.75-to-1 sealed gear-reduction drive and full ball bearing construction. Includes shims to set pinion-gear engagement, when necessary. Approved by all leading sanctioning organizations. Fits all Chevy V6 and small and big block V 8 engines using 153 or 168 tooth flywheels. Heavy-duty PROFORM P/N 66258 weighs 1-1/2 lbs. more and is 1 inch longer than P/N 66256. Sold individually. 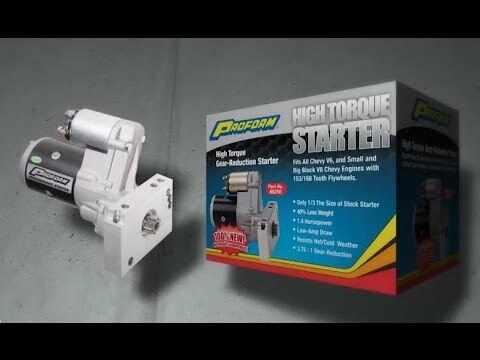 Note: Starter is a midsize and may have clearance issues with select headers and oil pans.